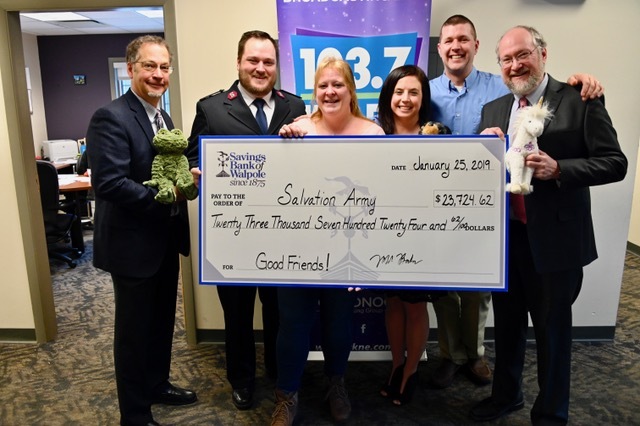 Keene, NH – Douglas Cuddle Toys and the Monadnock Radio Group/KNE-FM along with Savings Bank of Walpole (SBW) helped raise $23,724.62 during the Good Friends campaign that benefitted the Salvation Army of Keene. The annual campaign is held each year and takes place during the holidays. Douglas Cuddle Toys Sunbeam the Unicorn, Nipper the Dog and Fenton the Frog were the “Good Friends” and faces of the 2018 campaign. The stuffed animals were sold for $10 each at all SBW branches with proceeds from each sale going to the Salvation Army of Keene. “We’re grateful to Douglas Cuddle Toys and WKNE-FM and the Monadnock Radio Group for the outstanding job they did in creating and implementing fundraising efforts for the Good Friends campaign which benefited our efforts toward helping the community and people in need,” says Salvation Army Lt. Nicholas Senik, who received the check during a special ceremony. “Having Savings Bank of Walpole branches serve as point-of-sale and fundraising collection centers was invaluable in terms of making the campaign a success. We truly appreciate their involvement.” The Good Friends Campaign is the largest fundraising effort in the Keene area that’s facilitated by outside organizations. Founded in 1875, Savings Bank of Walpole is headquartered in Walpole and serves the Connecticut River Valley and Monadnock Regions of New Hampshire and Vermont from offices in Walpole and Keene. With assets totaling $400 million, the Bank offers a wide range of financial products, including services to individuals, businesses and organizations. The Bank is affiliated with NH Mutual Bancorp, further enhancing the quality products and services it provides to customers. The Bank’s SBW Wealth Management division offers financial planning services. Savings Bank of Walpole is an equal housing lender, and member of the FDIC. For more information visit www.walpolebank.com or call (603) 352-1822.